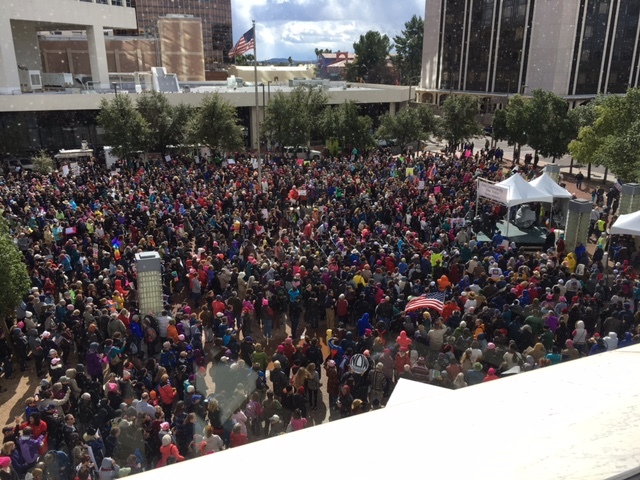 The estimate of the huge Women’s March in Tucson crowd that gathered this morning at Armory Park on S. 6th Avenue and marched to Jacome Plaza (in front of the Joel D. Valdez library) was about 15,000. Lots of very creative signs went by, carried by people of all ages, children, elderly, even people with crutches and walkers…gay, straight, multi-racial, many with dogs, wagons, etc. Every few blocks people were chanting “This is what Democracy looks like”. Here’s some photos of today’s crowd. 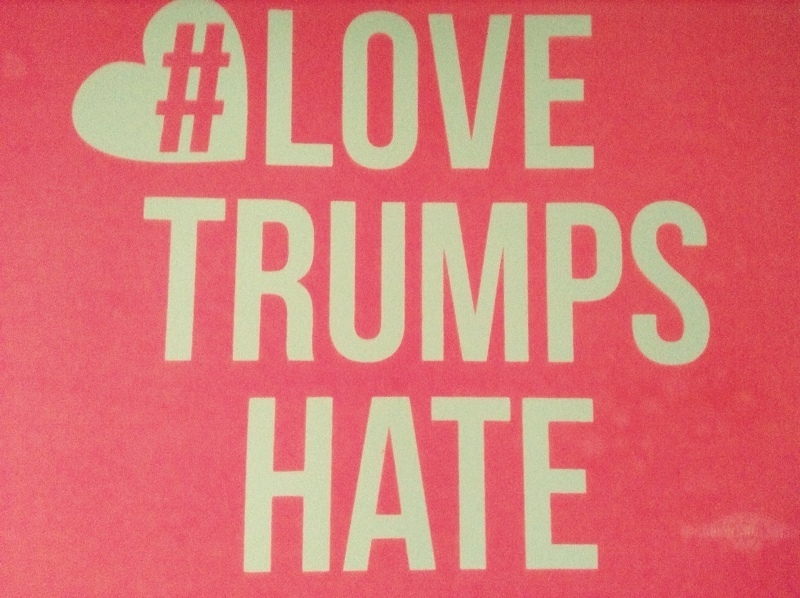 Many signs said #LOVE TRUMPS HATE in bright pink (see below). We saw CD 3 Congressman Raul Grijalva and later District 5 Supervisor Richard Elias march by, as did many, many Tucson activist friends. Later we heard Ward 1 Councilwoman Regina Romero speak at the Tucson Solidarity Rally, ending with “Si se puede”. Waffles the Clown was standing nearby on Stone Avenue and wisely said it was time for people in America to “wake up”. This was indeed what Democracy looked like today on January 21, 2017, the day after Republican Donald Trump was inaugurated 45th President of the United States. 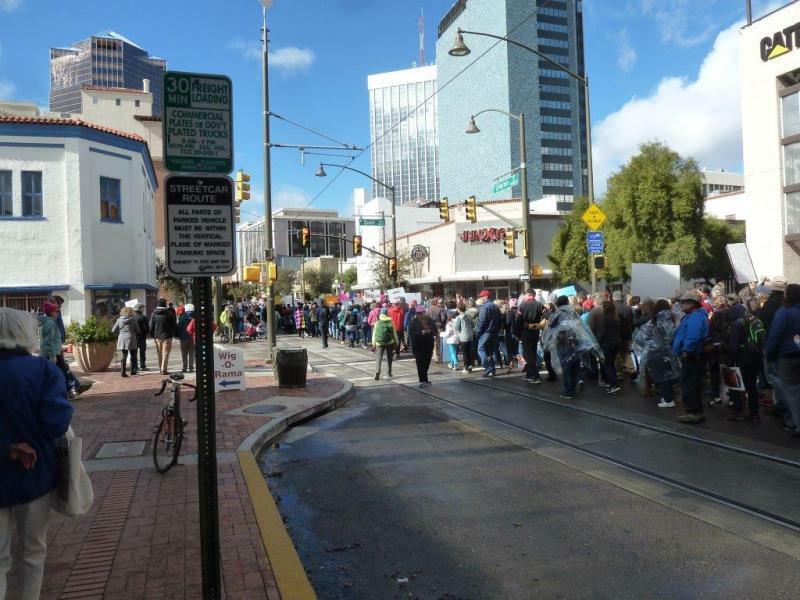 I marched but was a little that the speakers seemed to think that the red, yellow, and brown people were slighted and mistreated by the white man. 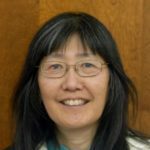 I am a white woman, but also part American Indian. I do not speak Spanish or any of the Indian dialects but am so very proud of my Indian self. I am 70 yrs old and homeless in this city and have suffered from prejudiced from the brown community. I know that some of the African Americans have been raised to hate white people because of slavery. I like to say that My people did not bring the slaves. I have seen pics in the movies and books documentaries, etc. They were brown people. I also like to say when the Spanish people get on their high horses about their land that was now American States ere Mexico. As I understand some Hispanic sold a bunch to the white man and also the white won the Spanish Am. War. I like to say ‘The INDIANS WERE HERE FIRST.” They came from Spain bringing the Indians new diseases, moved them to reservations, converted them to their religions or tried to. I am disappointed that there was not 1 homeless person, homeless veteran, or homeless white looking like myself to speak. They say they want LOVE# all around among all of us—but I don’t think so. – Who stripped him of his voting rights? – Did anyone actually stop him from voting? – If so, why didn’t he call the Attorney General (the number was posted at every polling place and was mailed out with every ballot)? 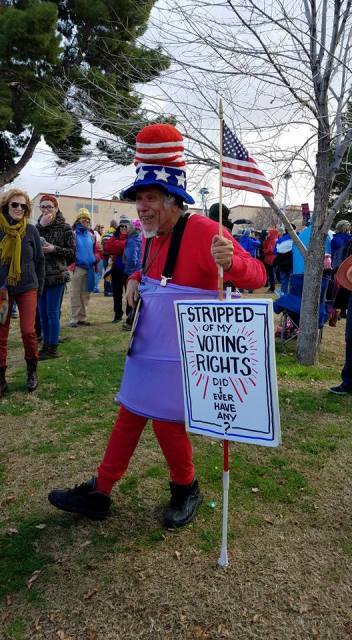 – If not, why did he think he lost his voting rights? – Did he even bother to vote? – Why doesn’t he know if he ever had the right to vote? – Has he ever voted? – Did he ever try to vote? – Did he believe the hysterical rhetoric and actually believed he had been disenfranchised and didn’t try? – Is he a mental incompetent who has no idea what he is doing, or has ever done? – Is he a “post-apocalypse” democrat spouting histrionic dramatics in order to curry favor with, and receive adulation from, fellow scaredy cat democrats? if this is what democracy looks like why did trump win arizona along with war monger mccain and the legislature? it took longer to call arizona because latinos were voting against arpaio and whites were voting against helen purcell and many of these also took time to vote for clinton. were pro life latinas who voted for clinton alowed in your march. they were not alowed in washington d.c. march.the only thing that scares arizona republiscum is the growing latino vote. You captured the best of an amazing day. I hope the high of today translates into action going forward. Good to see you in the March yesterday. So many creative signs went by, it was truly amazing as it was such a huge yet peaceful March. 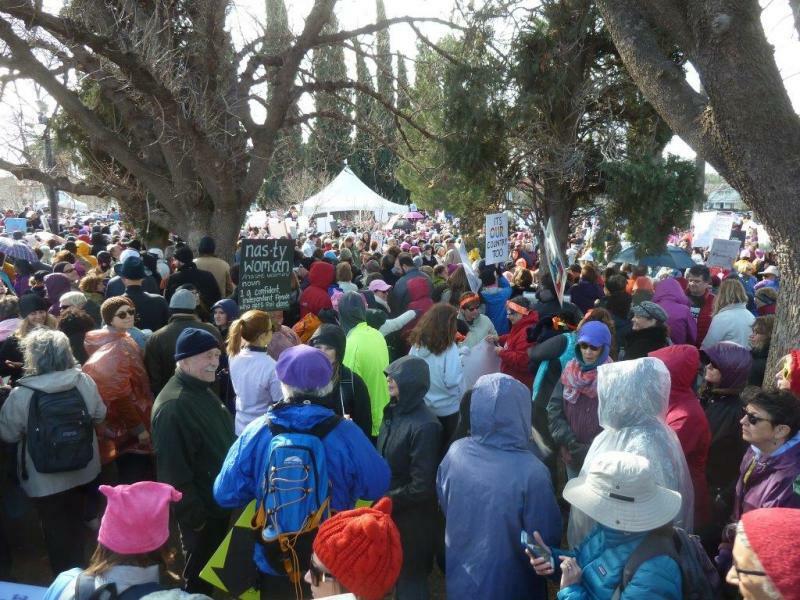 I will continue to post in our Blog for Arizona calendar of upcoming events as groups translate this Women’s March into action. Thanks for all your comments and links. Yes, it doesn’t stop here, today. 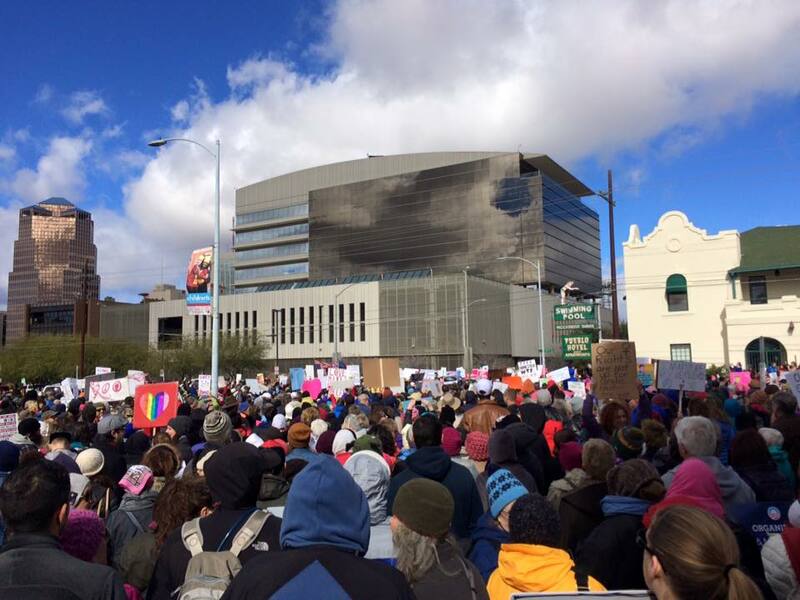 Tucson and many other cities all over the world showed that the people are watching for Democracy to prevail. PS:The Legislative website at the State Capitol is STILL messed up!!!!! Today was an absolutely amazing, unprecedented, historic day. There has never been anything like this in this country or the world the day after the inauguration of a US president. I am absolutely blown away. This movement needs to get moment and morph into something that recurs again and again on a regular basis, especially throughout the next 4 years. This does not stop with one event.